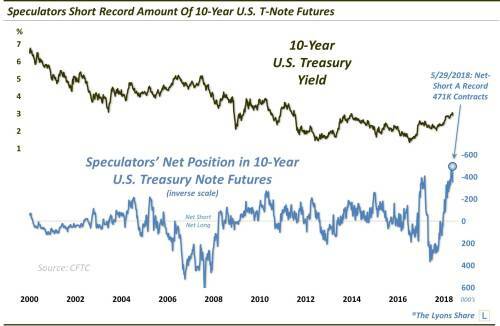 From Dana Lyons: Speculators in 10-Year T-Note futures are once again holding a record short position; will that put a badly needed bid under the market? Last week, we published an extensive post for TLS members on the prospects for various segments of the bond market. In the post, we mentioned that one of the most favorable factors in the bond bulls’ favor was the “near-record high level” of short interest in the market. Now, we didn’t know at the time, but we could have categorically stated a “record high level” of short interest — at least based on the futures market. That’s because, according to the CFTC’s Commitment Of Traders report, Speculators are now holding their largest net-short position in the history of the 10-Year U.S. Treasury Note futures contract. As we have mentioned many times, futures Speculators are often referred to as the “dumb money”. Now, this does not mean that Speculators are always wrong. Rather, they bear that moniker because they are typically wrong at extreme positions and key junctures in the underlying contract. Of course, one of the challenges can be in identifying what constitutes an extreme. However, present circumstances, e.g., the largest Speculator net-short position in history, would certainly appear to qualify as an “extreme”. So will this huge short position result in a massive short-squeeze induced bond rally? Or will the momentum in rising rates supersede trader positioning in this case? That remains to be seen, but we laid out both the bullish and bearish scenarios in our extensive “Bonds Away?” post last week — including the key levels to monitor in the 10-Year Yield and the market’s most likely path according to our analysis. The iShares Barclays 7-10 Year Trasry Bnd Fd (IEF) was unchanged in premarket trading Tuesday. Year-to-date, IEF has declined -3.14%, versus a 3.43% rise in the benchmark S&P 500 index during the same period.